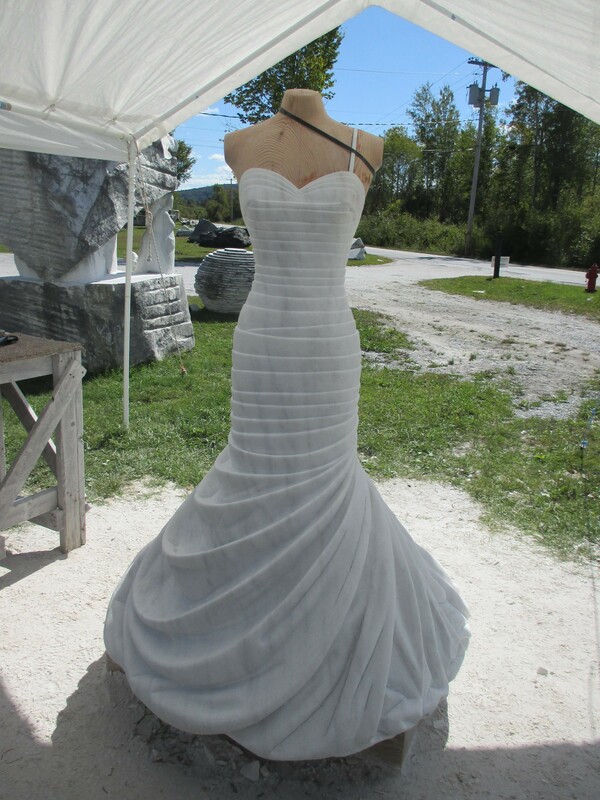 For the past two months in West Rutland, the Carving Studio & Sculpure Center's artist-in-residence Alasdair Thomson has been at work on a stunning series of marble sculptures: dresses. The Scottish-born, Italian-trained master sculptor says he's "exploring the way fabric hangs and folds," and is attempting "to capture that lightness and gracefulness in stone." The articles of clothing in the series, called the Identity Collection, were donated by friends and family — and by a popular bridal designer and television personality, Pnina Tornai. Until the end of September, visitors to the Carving Studio & Sculpture Center can get a look at Thomson's sculpture of a Tornai dress. After that, it's headed to the Big Apple to be featured in the designer's runway show during New York International Bridal Week, according to Carving Studio executive director Carol Driscoll.